Shopping for yourself, or for a vinyl lover in your life? Not sure where to start, or too pressed for time to scroll through thousands of record listings? Then you’re in the right place. We made this page to make browsing our inventory as easy as possible. Here we’re highlighting items we’ve added for the holiday, as well as some choice pieces of vinyl, so that you can make a quick decision and get back to shopping for all the non-vinyl loving people on your list. If you’re looking for our downloadable pdf, which we featured on social media this season, that’s also here. But let’s get onto the inventory! So without further ado, here’s whats new and notable. First up, we have this record cleaning solution. We’re pretty proud of this product, as it’s our own recipe. After multiple tests on records from our own collection, we’ve found that this solution is an effective cleaner and is very quick to dry. It can help to reduce noise on your record by cleaning out the dirt, dust, and grunge that builds up in the grooves of a record. To use, you simply spray the cleaner onto the record, then wipe it clean. Our formula contains no fragrances or oils. Each 2 oz bottle will clean approximately 25-30 records. At $7 a bottle, it makes for an excellent add-on, or stocking stuffer! Next, we have this record clamp. If you don’t know about record clamps, you’re likely wondering, what is a clamp and what does it do? Well, record clamps are basically weights that are placed over the spindle onto the label to apply downward pressure on the center of the record. The weight of the clamp eliminates any pockets of air between the record and the turntable platter, which is important because those gaps create vibrations that your stylus picks up as noise. In short, they improve the sound quality of your record. This is the perfect gift for a collector who has been at it for a couple years and is looking to step up to the next level. 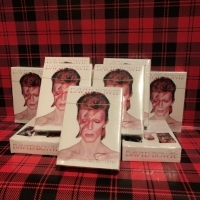 Finally, we have a small gift/stocking stuffer that celebrates one of our favorite musicians of all-time, David Bowie. You know, Ziggy Stardust, the Thin White Duke, David Jones. No matter how you know him, you’ll recognize him in this deck of cards which memorializes each of his different incarnations and eras. This officially licensed deck of playing cards pays tribute to Bowie through 52 different images depicting the musical legend. Of course, we also have lots of vinyl of sale. You can currently browse our stock here on Discogs, or over here on ReverbLP.